The career of William Shatner, from Star Trek captain to Priceline.com pitchman, is a case study worthy of exploration, not least as a prime example of the pitfalls of self-aware irony. The actor no doubt makes a handsome living sending up the whole notion of "William Shatner," the pompous, hammy figure of fun belting out kitsch hits like "Convoy" and "Jive Talkin’" in his inimitable acid casualty cadence. And it’s not as if he was exactly a master thespian before lapsing into permanent self-parody. But Shatner certainly had charisma, star quality and anything-goes gusto to burn, right up through the later Star Trek movies. His pre-Trek career is dotted with oddities, including an adaptation of The Brothers Karamazov, a Roger Corman quickie on the evils of racism called The Intruder, and most obscure of all, a low-budget horror movie shot entirely in Esperanto: Incubus. Recently rediscovered by producer Anthony Taylor and issued on video for the first time, Incubus has rarely been seen in the past thirty years. The film has acquired an aura of legend in some circles, due not only to its unavailability, but also to the "curse" that supposedly befell members of the cast and crew, several of whom were murdered or committed suicide after its completion. And then there’s the Esperanto angle. Incubus is the only film shot entirely in the artificial language, which was created in the late 1800’s in the hopes that people of all nations would learn it and be able to communicate through it. (Supposedly, millions of people speak it to this day.) But even beyond the initial curiosity factor, Incubus is a movie worth checking out, particularly for horror movie buffs. Like 60’s low-budgeters Carnival of Souls and Night of the Living Dead, Incubus eschews elaborate effects and voluminous gore in favor of generating a sense of dread through black-and-white atmospherics (not that these cheapies really had a choice in the matter). Written and directed by Outer Limits creator Leslie Stevens, the story revolves around an enchanted patch of woods called Nomen Tuum, where legend has it the water possesses restorative healing powers akin to the Fountain of Youth. This forest is also haunted by succubi that prey on the vain humans who come seeking the magical waters. One succubus, Kia (Allyson Ames), is bored with crushing the skulls of bad people – she wants to find a genuinely virtuous person to mess with. 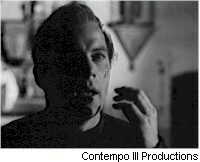 Enter Marc, played by Shatner, who lives with his sister in a nearby cottage. Kia sets about seducing Marc, but falls for him instead, raising the ire of Kia’s fellow demons, who summon the Incubus (Milos Milos) to set things straight. Freudians could likely have a field day with Incubus, particularly as regards Marc’s unusually close relationship with his sister. Other discerning viewers will no doubt be put off by the thin story, or the occasionally overt silliness of the film (Shatner has one howler of a soliloquy near the end). Nevertheless, the movie casts a unique spell that compensates for its narrative shortcomings. It’s like a foreign film from a country that never existed. This is due in no small part to the exquisite cinematography by Conrad Hall, who won the Academy Award this year for American Beauty. Hall works wonders with light and shadow here, lending Nomen Tuum a fairy tale quality far removed from the hyper-real colors of his most recent work. The use of Esperanto adds to the otherworldly feel as well, though no consistent accent for the language emerges (Shatner sounds Italian when he orates, while others might well be speaking Latin or Portuguese). The one major use of special effects in the film – the Incubus transformed into a goat-like creature – is both disturbing and laughable. In some shots it appears startlingly realistic, and in others just looks like a stuffed animal. The most effective scenes, though, achieve a minimalist eerieness through simple effects like the sound of wind whistling through trees, or sunlight shimmering on water. One minor quibble about the restored Incubus: the computer generated subtitles tend to appear too high up in the frame, occasionally blocking facial expressions or crucial action. Still, considering that the original negative was long ago lost and that the film had to be painstakingly reconstructed from a single print found at Cinematheque Francaise in Paris, it looks great. Incubus deserves an audience beyond the William Shatner completists who will put it on their shelves alongside their Captain Kirk Pez dispensers.